As noted here, the Downtown Mall is the worst mistake in Las Cruces history. Since its completion in 1974, there have been many attempts to make it more appealing to visitors. In 1996, the city commissioned Lea Anne and Tom Askman to create a series of sculptures for the Mall to commemorate El Camino Real. The La Entrada Monument is gone — moved to storage. The removal of the monument is part of the renovation to restore Main Street and remove the Downtown Mall. This reverses the most disastrous public policy decision in Las Cruces history, which closed the historic old street and converted it to a semi-open mall. La Entrada’s creator Anthony Pennock supervised the monument’s disassembly. A new location for the monument has not been selected. 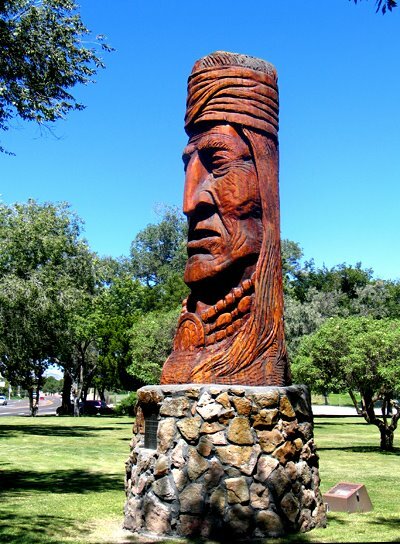 Las Cruces has one of Peter Wolf Toth’s Whispering Giants, as noted here. Since yesterday was the 50th anniversary of the Hungarian Revolution, this is a good time to review his book on his sculptures and life, Indian Giver. 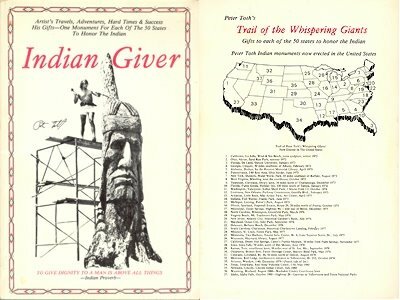 Indian Giver was published in 1980. It begins with his childhood in Hungary. He was born in 1947, the seventh child in a family that eventually numbered 11 kids. Conditions under the communists were brutally harsh, and got even worse when what little property his father had was taken and given to a party member. They were left with a dirt-floored house in which the only furniture was a table and 13 chairs. When the people of Hungary revolted against the Russians, it appeared at first they had succeeded. The Russians even agreed to negotiate — but it was a ruse. They returned with a huge force, mercilessly crushing all opposition. Mass arrests and executions followed. Two of Toth’s brothers escaped to the West, and Toth’s parents decided they would follow. For a short period of time the Yugoslavian border was open because the United States was paying Yugoslavia a bounty for every Hungarian that was permitted to leave Hungary. After a dangerous escape and two years in refugee camps in Europe, Toth and his family came to the United States as sponsored immigrants. Following his account of his life, Toth describes how he carved his first sculpture in a rock cliff, motivated by a compelling image he saw in the stone. That was 1972. After carving a second sculpture in wood, he decided he would carve one for each state in the country, taking nothing for his work. The difficulties and rewards of the first 27 “Whispering Giants” are described, and pictured. These sculptures are not “works” created in a studio — they are his life, requiring months of travel searching for the appropriate tree and location, and months of carving. In releasing the image he sees in each unique piece of wood, he satisfies something deep in himself. But he also makes it clear the work itself is a physical pleasure — the outdoors, the textures, the fragrances — even scrubbing pitch out of his hair. This is a wonderful, exuberant book. It is no longer in print, so see if you can find a used copy. These monumental sculptures are the life work of Peter Wolf Toth. Mr. Toth was born in Hungary and escaped to the United States during the 1956 Hungarian Revolution. 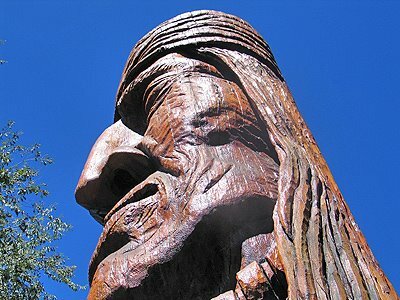 In 1972 at the age of 24, with no prior sculpting experience, he carved an American Indian sculpture at Wind and Sea Beach in La Jolla, California. Shortly thereafter, he decided to dedicate however long it took to create 50 such sculptures, one for each state. He didn’t stop at 50 and has now created 67, one or more in each state and the rest in other countries, including Canada. 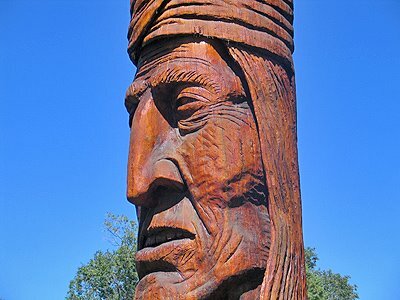 The sculptures honor Native Peoples and are called as a group The Trail of the Whispering Giants. Each sculpture is a gift to its location. He accepts nothing for them. He supports himself with other work while doing the carving. The sculpture given to New Mexico is called “Dineh” and was finished and mounted in the park in 1986. Here’s a partial index of the Giants. 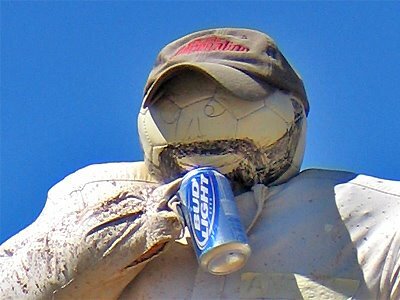 This guy’s been here for a couple of years, so it’s not a Halloween thing. Any garden is long gone. The first St. Genevieve’s Church was built in 1859. 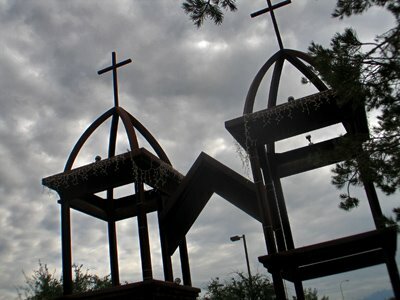 In 1886, the church’s adobe structure was replaced by a brick cathedral, which was fronted by two 44-foot bell towers. In 1967, this structure was demolished and a new church built at a new location — a huge historical loss. 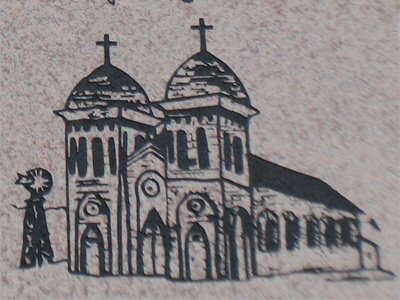 In 1998, a monument to the old cathedral was constructed at the church’s original location. As part of the process of redesigning the Las Cruces downtown (most would say fixing the previous huge mistakes), the La Entrada Monument must be moved to a new location. The Monument stands now in the middle of what will be an extension of Main Street. 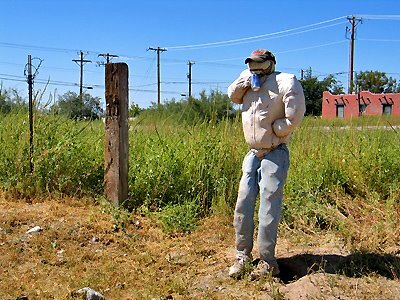 The Monument consists of two half-circle walls that commemorate the arrival of Spanish culture into the Mesilla Valley. Anthony Pennock, the artist who created the Monument in 1997, will supervise its removal and reconstruction. Mr. Pennock is a native Las Crucen.